This set of Molecular Biology Questions and Answers for Campus interviews focuses on “Methylation of Eukaryotic DNA Controls Gene Expression – 2”. 1. The CpG islands generally consist of how many GC bases? Explanation: At certain sites CpG dinucleotide occurs at higher frequency and is referred to as CpG islands. CpG islands are approximately 1000 bases long and show an elevated G+C base composition. Explanation: CpG islands are often associated with the transcription start site, that is, the promoter region. About 60% of human genes have CpG islands at their promoter regions. 3. The Intergenic CpGs are more commonly methylated than in the intragenetic region. Explanation: CpG islands in the genome are located in both intragenic and intergenic regions. In vertebrates over 80% of the methylated cytosine residues are found in the intragenetic regions. In contrast CpGs within the CpG islands are generally either not methylated or have relatively low levels of methylation. 4. Major methylation of CpG islands does not include? Explanation: The methylation of genome is persistent throughout and is missing only in regions such as CpG islands within the promoter and enhancer regions. Methylation in these two regions may lead to the silencing of the gene itself. 5. De-novo methylation leads to the phenomenon of genetic imprinting in the offspring. Explanation: Maintenance methylation leads to the phenomenon of genetic imprinting in the offspring. This phenomenon controls the expression of certain genes involved in the development of mammalian embryos. 6. Both the imprinted genes inherited from either parent are expressed in an offspring. Explanation: In an offspring only one of the imprinted genes inherited from either parent is expressed. This phenomena is known as allelic exclusion. Explanation: In the phenomenon of allelic exclusion the active allele is known as hemizygote. And the phenomenon that is exhibited by it is known as functional hemizygosity. 8. Gene of which of the following protein/enzyme/hormone is an example of paternal Hemizygote? Explanation: An example of an imprinted gene in mammals is the insulin like growth factor 2 or Igf-2 which encodes a growth factor. Only the paternal copy of the Igf-2 gene is transcribed and is not expressed from the maternally inherited chromosome. 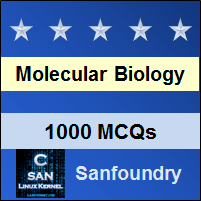 To practice all areas of Molecular Biology for Campus Interviews, here is complete set of 1000+ Multiple Choice Questions and Answers.